Well it seems everyone has a view on Lake Waituna, even those that have never set foot in the catchment, never fished, hunted ducks or farmed in the area. The issues around the health and state of Lake Waituna are complex and emotive – no more so than for those who live and farm in the catchment – I am one of those people.Our sheep farm is beside Lake Waituna and our family has been here for more than 45 years. During that time we have “brought in” hundreds of acres. We were encouraged to do this by the Government of the day. We drained and ditched and have expanded our farm over the years. We, like others in the catchment, have increased production, paid taxes and rates and in so doing helped build our province to what it is. While we have respect for the “greenie” ideals, this is not a perfect world and there must be someone physically working to pay the bills, to fund the teachers, the hospitals, the Superannuation and of course even the Conservation Department. We understand that our farm, like many others in the lower end of the catchment, may have been better left as a buffer for Lake Waituna but when this farm was formed production was rated more highly than conservation. And, despite the outcry from all those green, as it happens that is still the case. We offered to sell our farm to DOC only a fortnight ago. They declined. Unfortunately the greater number of these people have heard only one side of the story. They’ve heard that the lake is heavily polluted, that the ruppia is dying, the algae is taking over, the lake is full of sediment and it is likely to flip to an algal dominated state at any time … they’ve also heard that intensive farming has caused all this. In the meantime, the Green army has done a marvellous job of misinforming the public. The average Invercargill city dweller seems to believe that the creeks in the catchment run green with dairy cow effluent and that if we were to be proactive with riparian fencing and get the cows out of the catchment then Lake Waituna could be saved. Our catchment has more riparian margins than most others in Southland. There’s no doubt that during peak flooding events the main channels are significantly discoloured. But, the water doesn’t run green it runs clay-brown and funnily enough it runs the same colour in the middle of summer – when there’s no winter grazing. The colour of the water in the creeks (when in flood) is the same colour as the creek banks. On Friday ES councillors were taken on a tour of the catchment. They got to see our badly eroded creek banks, not all of them… but enough for them to see that we have a significant problem. They also got to see some of the riparian margins in the catchment, again not all of them, because in some places the riparian plantings and riparian fences are no longer there. They have fallen in and been swept down to Lake Waituna right along with tonnes of creek bank. So, why are the creek banks eroding? There’s several reasons for this including continued heavy rainfall, more flash floods etc… but the consensus among farmers is that the creeks are trying to revert to their natural routes. Most of them were straightened decades ago by the Catchment Board (now ES) and it seems that Mother Nature is determined to put the bends back. If we are to prevent that happening, and limit sediment losses, then, we as a community need to invest heavily in re-battering of creeks and placement of rock etc.. But, as the councillors learnt on Friday the real solution for ES and for Lake Waituna is actually the harder and more expensive option – preventing the flow of sediment (with phosphate attached) to the lake by doing physical works within the catchment, starting with re-battering of creeks and erosion control. Farmers in the area want to work co-operatively for the better of Lake Waituna but the emotive nonsense that has dribbled forth recently has been detrimental and destructive to any farmer-council relationship. Direct, honest contact with farmers is the best way forward, as ES councillors discovered when in the catchment on Friday. 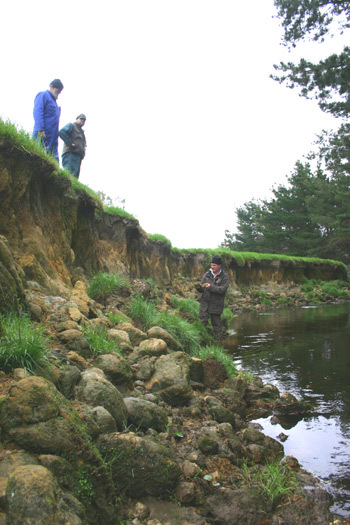 Members of the recently formed Waituna River Liaison Group inspect recent erosion on the lower Waituna Creek, which runs into Lake Waituna. From left Ewen Pirie, Derek Ballantine and Ray McCrostie. • Lake Waituna has not been a clean, pristine lake any time in the last 45 years. Was it before? Unlikely! The only time it is remotely clean is after it has been opened to the sea for a month or so and it is tidal. A closed-to-the-sea Lake Waituna is nothing like the open-to-the-sea version. • The water in Lake Waituna should not be crystal clear. The tannins in the peat down here stain the water. That’s the way it is, and that’s the way it should be. • The photo published in the Southland Times last week, supplied by Fish and Game of Jersey cows bogging on crop, was not in the Waituna catchment as stated. Mistake or deliberate misinformation by Fish and Game? • There was 100% compliance of winter grazing best practice in the catchment last winter so why would ES need winter grazing rules? • No-one in their right mind has wanted to swim in Lake Waituna for generations. It’s always had a muddy bottom and been murky. Our kids will play in the creek, but not in the lake, just like the generations before! • According to John Purey-Cust (probably about his fourth opinion on Lake Waituna): No farms should be allowed south of Ceasar Road. As it happens we own what is probably the oldest dairy farm in the catchment (south of Ceasar Road). It’s been a dairy farm for upwards of 50 years. It has an effective effluent system, and testing has shown that the water flowing through this dairy farm generally improves before it leaves. A far cry from the days when raw effluent was flushed down the creek. • The lake is going to flip at any time, they say. Old farmers and fisherman attest to the fact that the lake has flipped in the past but, that was not monitored or recorded by scientists, so it couldn’t have happened! • The sediment build up has been blamed on the increase in dairy cows. Back in the ’50s there was that much sediment washed into the lake that hundreds of trout died from blocked gills. But, they also point out that it came right in it’s own time. • And then there’s the algae, it’s everywhere. It’s in our duckponds, peat ponds and other places where sheep and cows have no access. Seems likely that it’s either climatic or bird related. We’ve also had huge unexplained die-offs of sphagnum moss and wiwi in recent times – cows or sheep could have influenced neither! • Fishermen say ruppia has come and gone many times in the past. They do not feel it is an accurate gauge on the health of the lake. And the fishing…I spoke to two Aussie fly fishermen a fortnight ago who had caught 96 trout from the lake within four days. • Water testing by ES has shown that, on average, Nitrogen and Phosphate levels in Lake Waituna are no worse than they were a decade ago.